"Your head is not inside the sauna, so you get to breath cool air the entire time. 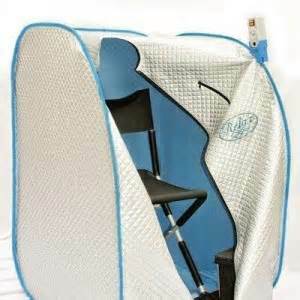 This makes the sauna experience much more comfortable and easier stay in long enough to get a full sweat." Sweating is the body's safe and natural way to heal & stay healthy. Far infrared sauna benefits the body by heating it directly causing a rise in core temperature resulting in a deep, detoxifying sweat at the cellular level, where toxins reside. Near infrared therapy stimulates the circulatory system and more fully oxygenate the body's cells. Better blood circulation means more toxins flow from the cellular level to the skin's surface to improve cell health, aid in muscle recovery and strengthen the immune system. Try it out! First Session Is Free!! Find out why the Europeans have been using infrared saunas for years.